I have been dealing with a lot of things thanks to the tornado off and on this past few weeks. All of these things such as mr pickles dieing, levion with allergies, tornado damage, no power and more. 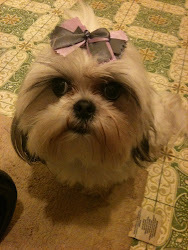 Now I can finnally set back and create my bows and give all my attention to customers, and my shih-tzus. We recently get a new pom after debating off and on. Mr pickles died right before the tornado and had a heart attack. That ordeal was the worse thing to happen. We lost a friend and a wonderful model but soon after we was informed of mr pickles brother. We are so greatful for having him as our new model.